Take Action to Give Georgia a Raise! Take action to support raising the minimum wage in Georgia to $15 an hour which will lift thousands of workers in our state out of poverty and off public assistance. Georgia workers making just $7.25 an hour leaves a family of three stuck below the poverty line. We see everyday families and workers struggling to get by in our communities and neighborhoods for no reason. Workers deserve better pay and we can change their lives by making sure that Georgia State Legislators vote for our communities and our families this year by raising the state minimum wage to $15 an hour. We deserve better in our state, we deserve leaders and politicians that care about the needs of our families and communities. We need Georgia State Legislators to walk into the capitol and show us that they have the backs of hardworking Georgians instead of big business and multinational corporations. We need them to vote in the interests of everyday working people and put the needs of our state's residents above all else. Currently, our state minimum wage is $5.15. If it weren't for the Federal Government Minimum Wage at $7.25 thousands of workers in our state would be making even less than they already do. All the while some Georgia Politicians claim that there is no need for a minimum wage at all. However, across the nation and especially here in Georgia, workers are standing up and saying that enough is enough. Workers in our communities are demanding $15 an hour and won't rest until their wages are raised! Thousands of workers making minimum wages are demanding a raise in wages so they can take care of themselves and their families without having to rely on public assistance. 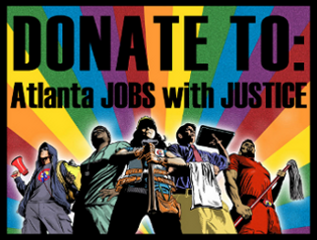 We need you to stand with Georgia workers and take action here to support $15 an hour for Georgia!